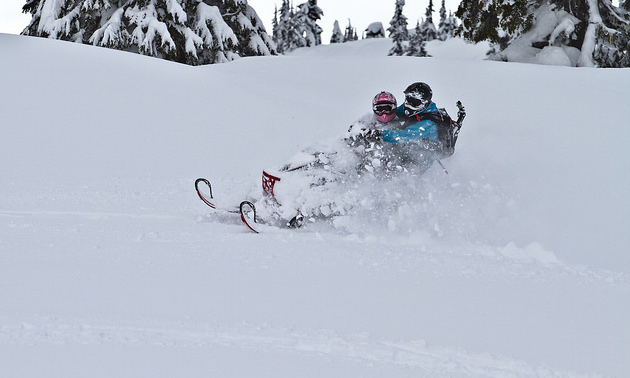 For many snowmobilers, one of the greatest joys we have is sharing the sport with friends and loved ones. Sometimes this consists of doubling or two upping people who do not have their own snowmobiles. 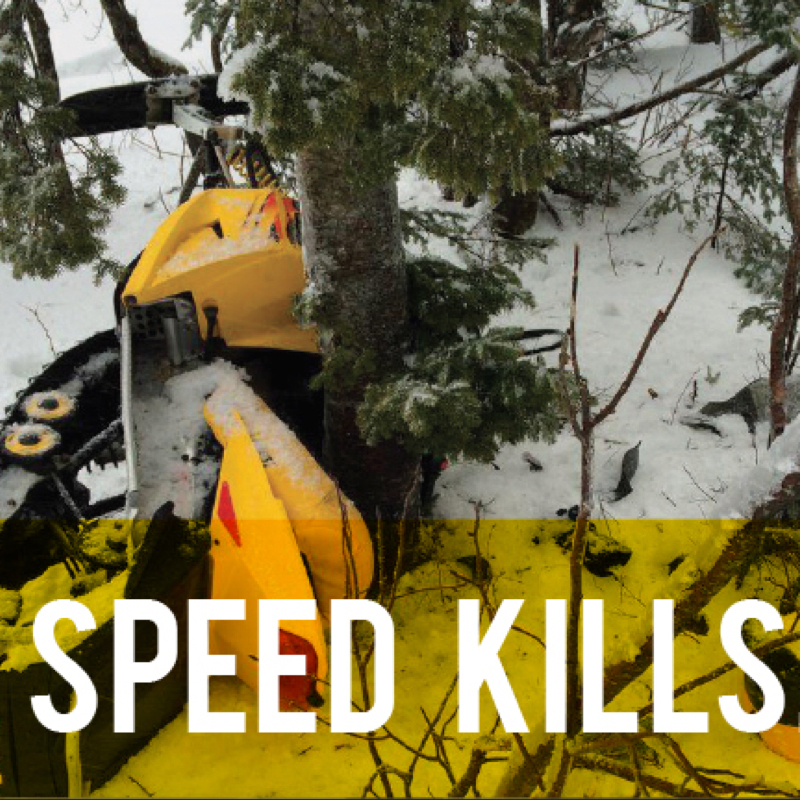 While it is an awesome gift to share with other people, there are certain key safety precautions that one must consider when two upping, especially on a sled that is not a two up trail-specific snowmobile. Different ways of doubling include the squirrel position, where the passenger is in front; traditional, where the rider is seated behind the driver; and tandem, where rider and passenger are side by side standing on each running board. Tandem is very popular with the sled skier-style of riding. Even passengers need basic safety equipment when they head out into the backcountry. Transceivers are a must. Avalanches are not discriminatory and do not target only those with transceivers. Should you become involved in an avalanche, everyone needs to have the equipment to be rescued. Helmets are an absolute must. It is crazy how many passengers are taken for rides without helmets. It only takes a moment for tragedy to strike, and a simple tip over could result in a head injury when not wearing proper protection. If riders are being shuttled in squirrel position, a chest protector will protect ribs and internal organs should the passenger be pushed into the handle bars. 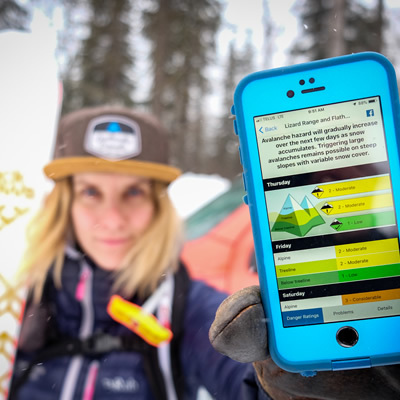 “If travelling in avalanche terrain, you and your passenger will each need to carry essential avalanche and survival gear," said Amber Granter of Trigger Point Snow Services in Golden, B.C. "Essential avalanche gear needs to be worn. An avalanche transceiver is worn underneath your clothing, and a probe and shovel need to be in a backpack/vest that is worn on you. This is important because if you were to get caught in an avalanche and someone is buried, you would have the basic tools to perform a rescue. If the only gear you carry is on your machine, your machine may be swept away out of reach or become completely buried, leaving you with nothing. The operator of a snowmobile is much warmer than is the passenger in most situations because the operator will be exerting energy and working up a higher core body temperature than the passenger who sits idly. The operator has the luxury of hand and thumb warmers, not so for the passenger who often is in the squirrel position gripping the mountain bar. Dress your passenger in layers that have an extra warm fleece mid-layer. Thick warm mittens rated for extreme cold temperatures are also a good addition along with warm boots and socks. Hot pocket-type inserts for boots and mittens will keep them extra warm. 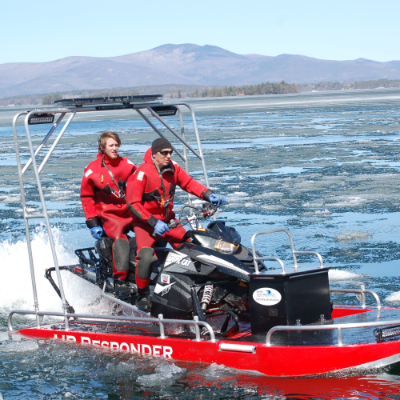 Many passengers underestimate how cold it can get and have no idea that their fashionable winter gear is simply not warm enough for snowmobiling. It is harder to ride with a passenger than without one. You may be the king or queen of side hill dangles, but with a passenger everything becomes that much more challenging. You have an extra person on board whose body may move contrary to your own, who adds extra weight and who takes away some of the elbow and leg room needed to pilot your snowmobile. Choose easy terrain that is within your doubling skill set rather than technical terrain you may venture into on your own. Things to be aware of when doubling are letting your passenger know exactly where the throttle is and the consequences of grabbing it in an effort to hold on. Many people have found themselves in a situation where the passenger has made contact with the throttle in error, resulting in a collision or loss of control. If you are new to doubling, take quick, easy trips first to get used to the skills needed to double another rider. Someone new to the sport of snowmobiling may have a bit of anxiety in situations you feel are second nature. Encourage your passenger to let you know when he or she feels frightened or anxious. You may have to simply explain a side hill, climb or jaunt through the trees, which seem almost unfathomable to someone brand new to riding. You may also find yourself in a situation where a plan B is necessary to ensure the emotional comfort of your passenger. If you are heading out for a ride with a passenger, it is not OK to abandon him or her in a clearing or in the trees so you can enjoy the rest of your day riding with your friends. Hearing stories of girlfriends and wives who have been left by themselves for hours while their significant other is off shredding the deep pow, sometimes even out of earshot, leaves me in a state of disbelief. If you take a passenger with you, keep it enjoyable for him or her and save the adventurous boondocking for another day. Riding with another person is flat out harder and takes much more effort than riding alone on the machine. While you may be eager to enjoy the winter backcountry, be sure to keep in mind the tremendous amount of effort it takes before asking to go along for the ride. Consider piloting your own machine, then you too can experience the freedom and joy of snowmobiling first-hand.